Communities that appear to be on opposite sides of U.S. politics come together for the first-ever Super Decathlon, uniting residents of Washington, D.C., and residents of Franklin County, Pennsylvania. Cooperation and team spirit are the winners. At a time when people seem to be talking a lot about a division between rural and urban America, men and women from Washington D.C. and Franklin County, Pennsylvania, gathered at the Otterbein Church Community Park in Waynesboro, Pennsylvania, on August 11 to play together. More than 40 people, from teenagers to near-septuagenarians, participated in fun, friendly team competition in the first-ever Franklin County / D.C. Super Decathlon, a daylong event co-organized by the D.C.-based Super Decathlon for One America and the New Hope homeless shelter in Waynesboro. Each of the 10 four-person teams was composed of two participants from the greater D.C. area and two from Franklin County. The goal? Have fun, build relationships, and strengthen connections between urban D.C. and rural Franklin County, which includes Waynesboro, a borough of 10,568 people, according to the 2010 census. Franklin County and D.C. are worlds apart, metaphorically. The population of Franklin County is 89 percent white; the median property value is $174,000; and President Trump won 71 percent of the vote. D.C. is 46% black; the median property value is $576,000; and President Trump garnered only 4 percent of the vote. Waynesboro, however, sits just two miles north of the Mason-Dixon line on the southern border of the state, and can be reached from D.C. by car in 90 minutes. Waynesboro is part of the Chambersburg Micropolitan Statistical Area within the Baltimore-Washington metro area. Like a traditional decathlon, the Super Decathlon consisted of 10 events, each allocating a certain number of points to winning teams. The events themselves, however, were far from orthodox. 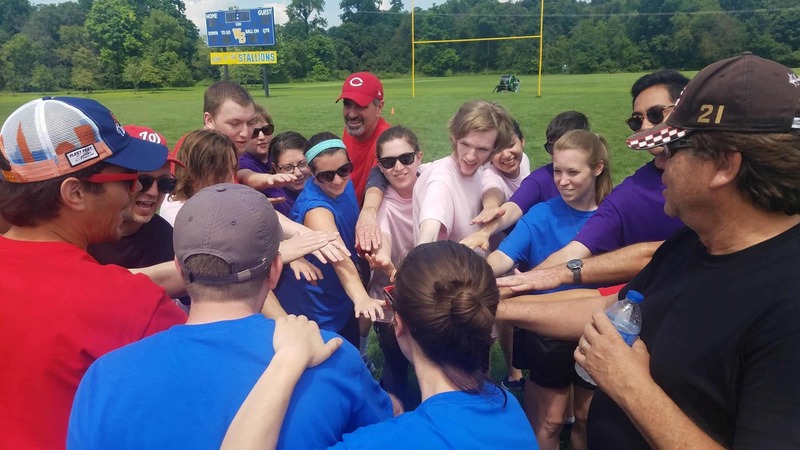 Teams participated in kickball, two relay races, dodgeball, trivia, soccer, color sudoku, blindfolded chocolate tasting from Zoe’s chocolates in Waynesboro, capture the flag, and a rock-paper-scissors tournament. Participants appeared to devote as much energy to teamwork as they did to winning. 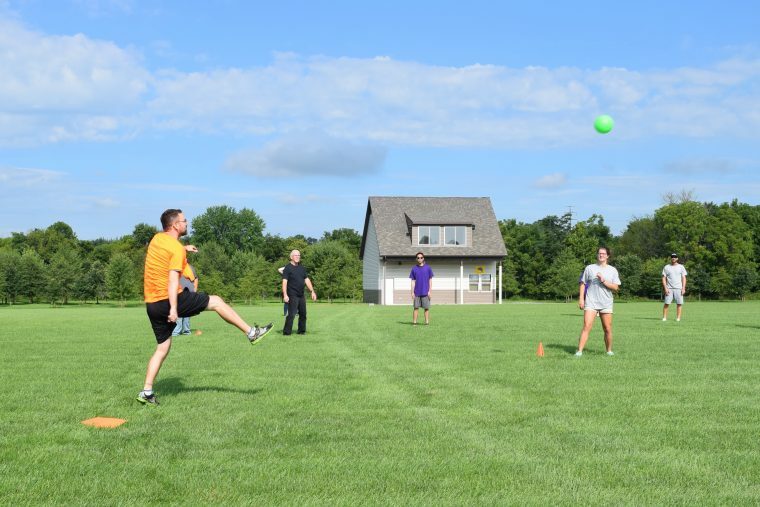 Team sports such as soccer and dodgeball required collaboration across teams, which provided additional opportunity to engage across the rural-urban divide. Prizes included gift cards from Washington, D.C., and Franklin County businesses and were awarded to the first and second place overall teams, as well as the two teams that demonstrated the most positive spirit and encouragement of others. The Super Decathlon also served as a community fundraiser. Many participants donated $30 to the New Hope Shelter on top of a $15 registration fee prior to the event. Bethesda Bagels donated bags of bagels that participants enjoyed for breakfast. For lunch, Subway and Domino’s in Waynesboro contributed subway platters and several pizzas, respectively. Additionally, the organizers conducted a silent auction next to the field. Participants bid on auction items such as two personal financial planning sessions from a senior investment professional, a professional massage, a private guided bike tour of D.C., a kayak trip on the Chesapeake Bay, and a stay at the Burgundy Lane Bed & Breakfast in Waynesboro. All of the money raised from the auction was donated to several Franklin County community organizations that supported and participated in the event: The Boys and Girls Club of Chambersburg and Shippensburg, Over the Rainbow Children’s Advocacy Center, Women in Need, She’s Somebody’s Daughter, and the New Hope Shelter. During the opening ceremony, a representative from each non-profit spoke about the services their organization provides to the community. Altogether, the event raised $1,260 for the five non-profits. Seventy-five percent of respondents to a post-event online survey carried out by the Super Decathlon for One America indicated that they would “definitely” or “probably” participate in another local Super Decathlon within the next year. One participant traveled from Los Angeles to participate in the event, and sounded as though he might do it again. The Super Decathlon for One America aims to translate budding relationships into collaboration to address local challenges. Helen Cammerzell is an intern for the Super Decathlon for One America. She is a 2017 graduate of Duke University.